In an effort to increase user participating in the App Store rating system, starting with iPhone OS 2.2, users who deleted an app were asked to rate it on a scale of 1 to 5 stars. This became a controversial move because developers were getting ratings from people who had removed an app from their phone which would most likely lead to the download receiving a low rating. 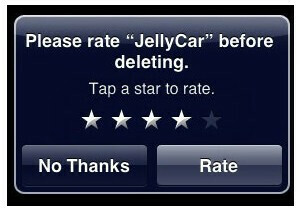 Because those who are happy with an application and keep it on their handset aren't asked to rate it, the number of stars that an application receives is skewed lower. Lower ratings equal lower sales equals unhappy developers. Thankfully, for the latter, Apple has removed the mandatory rating feature from OS 4.0 for the iPhone. This should lead to more honest ratings and improved shopping at the App Store. And some say there is no higher power. sounds rigged to me...like the current afghan president who "Rigged" the elections by a landslide!! Why??? And ur not forced to rate the app. That's the purpose of the no thanks button. Way to make apple sound evil.